There has been a renewed interest in Irish dance history with the success of such spectacles as Riverdance and Lord of the Dance. That history goes back thousands of years, in fact, and even the most modern showcase on Broadway has steps and methods that were being taught in Irish villages before the U.S. was even an idea. 1300 BC: First Feis - King Ollam Fodhla holds a great feast called Feis Teamhair, translated as House of Music. 795 AD: Norse Influence - Viking invaders settle, intermarry, and share their culture with the Irish. 1169 AD: Norman Invasion - The Normans brought with them the concept of the "circle dance," originally created in France. 1413 AD: Caroling recorded' - During a mayoral visit, this Norman custom of singing and dancing was held in Baltimore, Ireland. 1443 AD: Festival of Arts - the first Festival was held in Kelleigh as a celebration of music, dance, and poetry. Over 2,700 people participate. 1569 AD: Ladies of Galway - Sir Henry Sidney writes to Queen Elizabeth I telling her of the magnificent jigs danced by the women of this city, calling them "very beautiful." 1600 AD: Fynes Moryson - This secretary recorded the following about Irish dance history: "The Irish delight much in dancing but only in country dances…whereof they have some pleasant to behold, as Balrudery, and the Whip of Dunboyne, and they dance about a fire in the midst of a room holding sticks in their hands and by certain strains drawing one another into the fire; and this I have seen them often dance before the Lord Deputy in the house of Irish Lords." From this point on many references paint a fairly thorough picture of Irish dance history as it continues through to today. These include welcoming King James II to Ireland: "...young rural maidens weaving dances before him as he traveled." 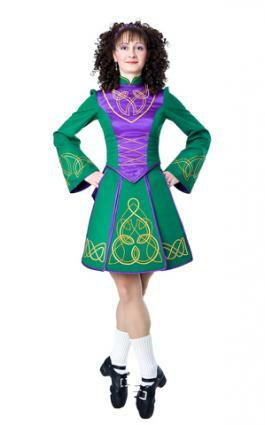 Irish dance history is not only a history of invasion. The English invaders also learned native dances of Ireland. One of these, called "Trenchmore" and based on an Irish peasant dance, was eagerly adopted by the court of Queen Elizabeth I. This dance led to other partnered dances such as the reel. Dancing in ceilis or small groups accompanied by fiddlers and pipers became popular in the late 17th century, with the fast-paced music assimilating new cultural influences as fluidly as the dancers moved. In the 18th century the Irish dancing master appeared, an intinerant instructor who would teach the youth in each district the group dances that were their heritage. Occasionally students would be separated out - most likely due to discipline problems, at first - and taught solo parts. This is the precursor to the kinds of spectacles choreographed by Michael Flatley and his colleagues today. Sometimes rival dance masters would meet at festivals, showing off their dance forms in intense competitions. The Feis remains an important part of Irish dance culture, and Irish dance is taught all over the world both to people with Irish heritage and others who simply enjoy the dance. Championships are held in Dublin every Easter for competitors from all over the world. Ceilis are still held all over the world by Irish and non-Irish alike. While it continues to evolve, the rich tradition of Irish dance history runs strong through the arts.